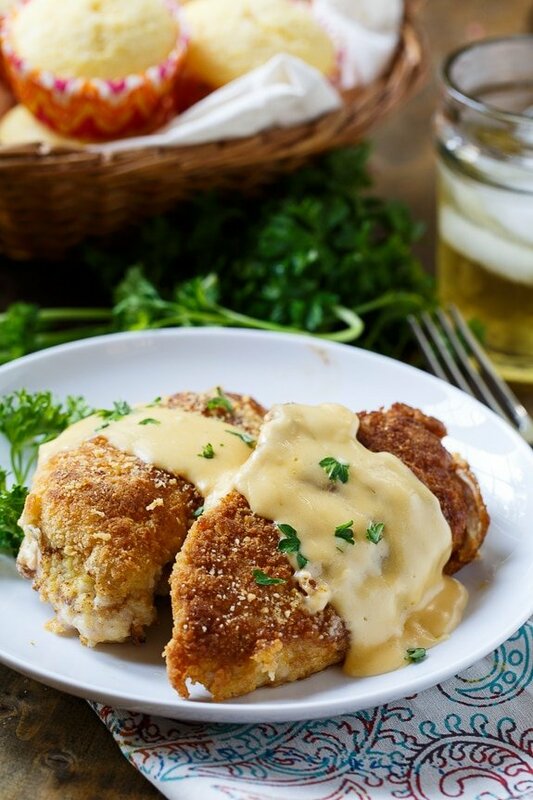 Boneless chicken breasts coated in a Ritz cracker crumb coating, pan-fried until crispy, and served with a cheddar cheese sauce. 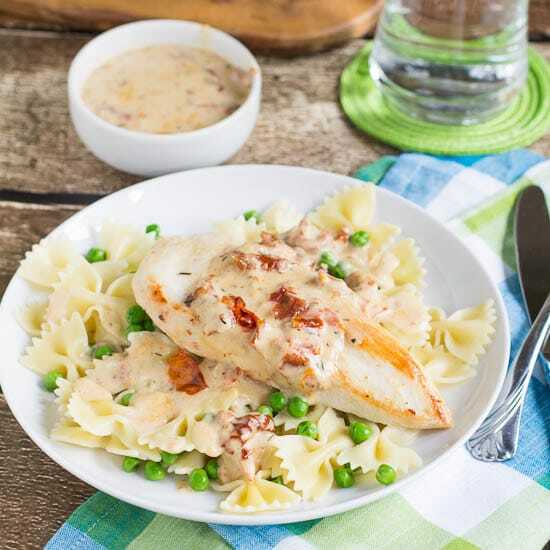 Kids really love these Cheesy Chicken Breasts and they make a wonderful mid-week meal. Crushed Ritz crackers are one of my favorite things to use as a coating for chicken or a casserole. They cook up crispy and buttery and just give the chicken that extra something. Plus they already come nicely seasoned with salt. 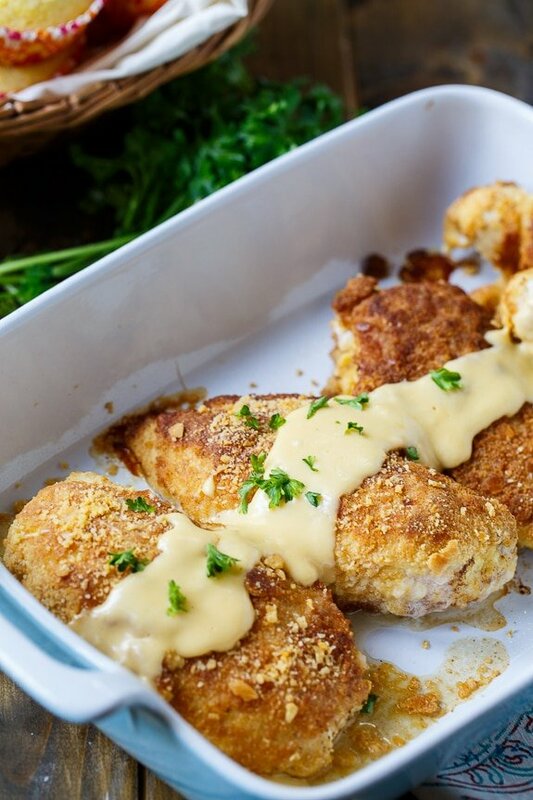 Once coated in a Ritz cracker and flour mixture with a little Parmesan cheese and paprika, the chicken breasts are cooked in a little butter until browned and then finished in the oven. 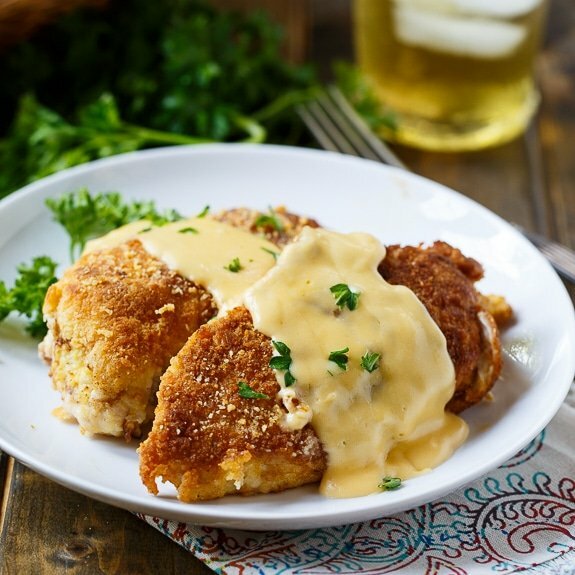 The cheese sauce is thick and creamy and has plenty of cheese flavor from a cup of shredded sharp cheddar cheese. White rice and a garden salad make excellent sides for Cheesy Chicken Breasts. 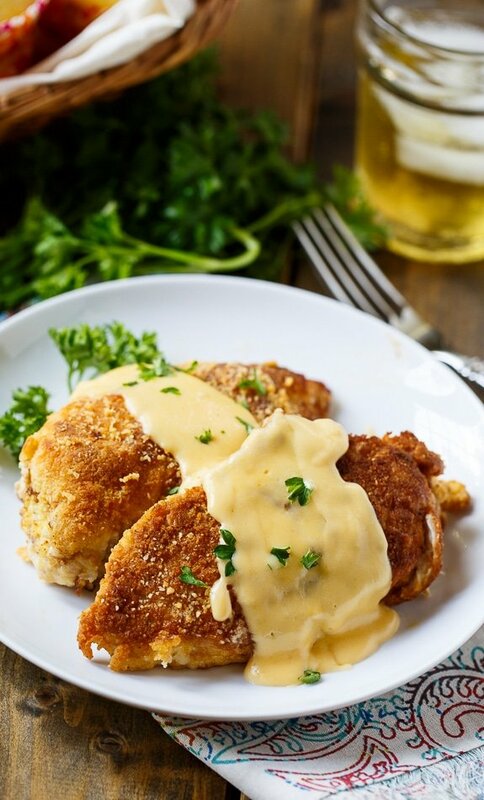 Crunchy buttery chicken. 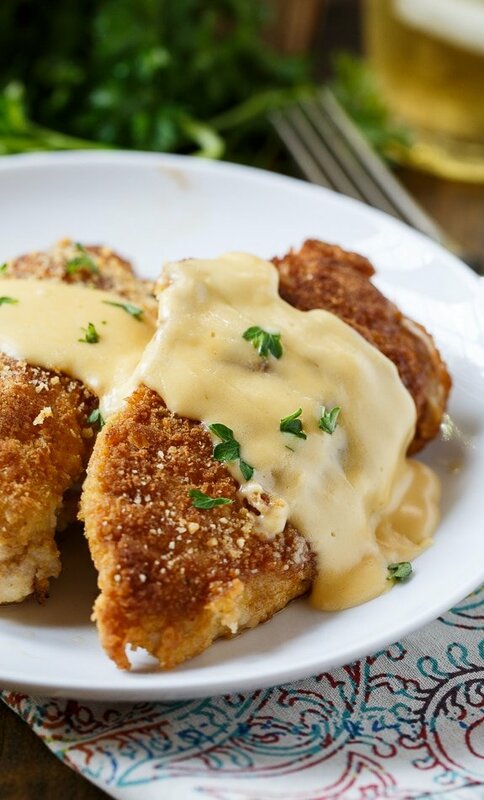 Thick and creamy cheese sauce. It’s simple comfort food made with ingredients you likely already have in your pantry and refrigerator..
No doubt about it, this is a meal you will want to cook again and again. 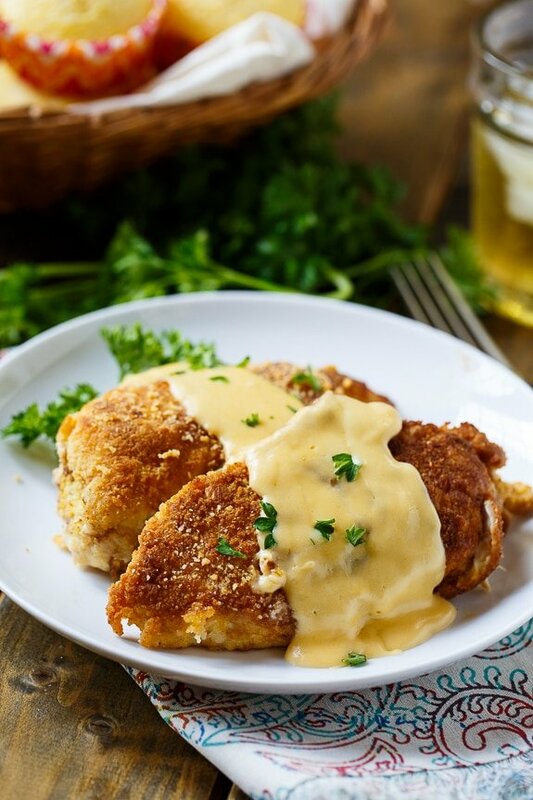 Boneless chicken breasts coated in a Ritz cracker crumb coating, pan-fried until crispy, and served with a cheddar cheese sauce. In a shallow bowl, whisk together egg yolks and water. Pulse crackers in food processor until fairly fine crumbs are formed. In a pie plate combine cracker crumbs, 1/3 cup flour, paprika, and Parmesan cheese. Coat chicken in egg mixture and then dredge in cracker crumb mixture. Melt 2 tablespoons butter over medium heat in a large nonstick pan. 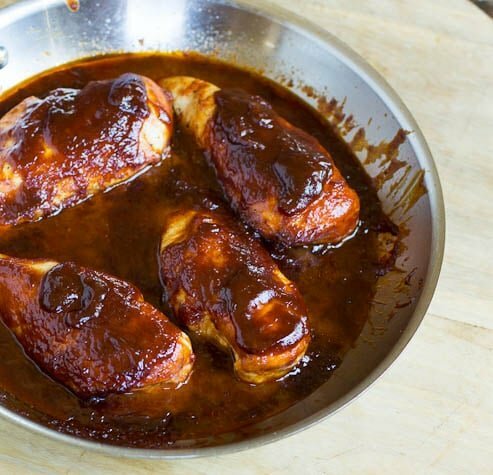 Add chicken, turn heat to medium-high and cook until golden brown on both sides, about 2 minutes per side. Place in baking dish and bake for approximately 25 minutes, or until cooked through. Meanwhile, melt 2 tablespoons butter in a medium saucepan. Stir in flour and cook for about 30 seconds. Gradually whisk in milk and cook until sauce simmers and thickens. Whisk in Worcestershire sauce. Remove from heat and whisk in cheddar cheese. Serve chicken topped with cheese sauce. This entry was posted in Dinner, Main Dishes and tagged chicken, poultry. Bookmark the permalink. For the chicken part of the recipe. It says canned roasted tomatoes but under instructions it says sundried tomatoes. Which is correct, canned roasted or sundried (not talking about the noodle part, I know that’s sundried)? I love using Ritz Crackers as a coating and as a crumb stuffing. It is looking delicious on this chicken. Oh my! This looks amazing! Wow do these look amazing! I’ve never tried a Ritz cracker topping on chicken before. Love the cheese sauce, too! I LOVE the idea of using ritz crackers as breading. I bet they taste awesome and get so crispy!